Just got back from Taipei, where I attended COSCUP, alongside troublemaker Xan López, both of us having been invited to represent GNOME. After a fairly smooth but long flight (followed by a shorter flight from Hong-Kong), I landed in Taipei International Airport where I met Max, holding a card with a GNOME foot and my name on it, at the arrivals hall. Max then drove me to the hotel, or rather, he was my driver to the hotel, as he insisted that I ride in the back seat rather than up front alongside him (I think you'll see a pattern emerging soon). Our very nice and modern hotel (with “North-European furniture”, as the brochure said, and it did indeed have Ikea branded glasses in the bathroom) was a stone's throw away from the Nangang Software Park MRT (metro) station. I only saw those on TV when I was a kid. I proceeded to catch up on my sleep, after a quick look at the TV channels (Hackers!). The next morning, thanks to Max' helpful cue cards, I managed to get myself a network adapter and cable out of Guanghua Digital Plaza. This place must be an absolute dream for people who like making their own computers, though the newness of the hardware is dependent on the use. No Bluetooth 4.0 dongles, but the latest in anime shaped USB sticks. After being reminded on the plane quite how important business cards were, I asked the hotel reception whether they could help me get this sorted. After 10 minutes of calls by the enormously helpful receptionist, Max arrived from another airport run with Xan. Ten more minutes of phone calls, Max drove me to the print shop, where they live designed my business cards. It took a good half hour. At which point I should mention that during that whole time Max's wife was in the car, double-parked not very far from the shop. And that Max managed to arrange for the business cards to arrive at the hotel. Snooze, mail, and we got ready for the speaker's dinner. In the lobby, we met David Cuartielles, the co-founder of the Arduino project, and Pofeng, one of the organisers. Pofeng proceeded to organise for my business cards to be delivered to the dinner we were just going to. I'll cut short on the presentations, as most of the slides and videos should find their ways online soon. Jonathan Corbet made a nice feature out of my presentation (which was followed by Aaron Seigo's Plasma active on tablets talk). Side note, if you cannot access the Linux Weekly News article, you can wait a week, or give to Friends of GNOME, and get a free LWN subscription. The talk was well received, and a few hardware makers are interested in our approach. Xan's presentation was also well received, and we started discussing the idea of Epiphany's web applications integration using standardised metadata information, as Firefox also needs such integration. I would advise future organisers of GUADECs and associated to talk to the organisers of COSCUP in terms of getting staff on the grounds, online social interactions (including COSCUP Cheese), or even the mobile apps for the conference. We tried our best to mingle amongst the conversations during the conference, but it's soon fairly obvious that the Westerners end up together, if only because we were all tourists. Which is how I ended up spending a fair bit of time with the Beijing-based German Ollo, Berlin-based Frenchman Paul Rouget (who's just bad at Mario), Malmö-based Spaniard David, Living-out-of-a-suitcase Xan, and Taipei-based Englishman James. We spent some time trying to find veggie food for Xan in the night markets, amongst the game arcades, Angry Birds T-Shirts, and potent smell of soy sauce (no, not the same one you have in your cupboard). The day after the end of the conference, the speakers were invited to a tour of the city. We went up Taipei 101 (where my mild acrophobia made me feel queasy looking down the emergency stairwell, 90 stories to the bottom), and down it for some gadgets shopping, and the most awesomest dumplings in the existence of the world at Din Tai Fung. This was followed by a visit of the National Palace Museum (where you could see the most amazing work on ivory, and jade, real craftsmanship), and the change of guard at Martyr's Shrine. The working hours are mostly European ones, but they're not in sync with the sun. So getting out of a dark building at around 10 AM means that you'll be in the noon sun, and nearly blinded. Bring sunglasses. It's really hot and humid (BBC Weather mentioned 36 Celsius, with 86% humidity for last Monday), bring light clothes. Women can buy a sun-umbrella locally. Bring a napkin/cloth to wipe your face. It's part of culture to exchange gifts amongst friends. Even if you don't have any friends there yet, the people are so nice that you are bound to feel that they deserve those gifts anyway. Bring gifts, especially foodstuff. Don't look like a plonker by not bringing business cards to any business meeting (like I did). You can probably get them printed in Taipei (expect to pay around 200NT for 200 business cards, eg. around 5£). Bring name cards (as they call them there). You're in the Republic of China, not the communist People's Republic Of China. My wholehearted thanks to all the COSCUP organisers, and the conference itself, for inviting us to Taipei, taking great care of us, and sponsoring our accommodation, to the well-connected Emily Chen (who everyone seemed to know) who proposed me for a talk, Max and his wife, for being the best of hosts (and for the Stephen Chow DVDs! ), and the GNOME Foundation for sponsoring my flight there. Like a large number of Desktop Summit attendees, I made my way back home shortly after the end of the conference. I will spare you the details of my schedule, and will share a few things of note. As I attended one of those recently, I did a presentation about them for the Advisory Board on Tuesday. The things to come out of the discussions that followed is that we would want more reporting in some cases, even post-hackfest if the network access isn't good enough, or there are loose items (filing bugs, long-term goals definitions, etc.). 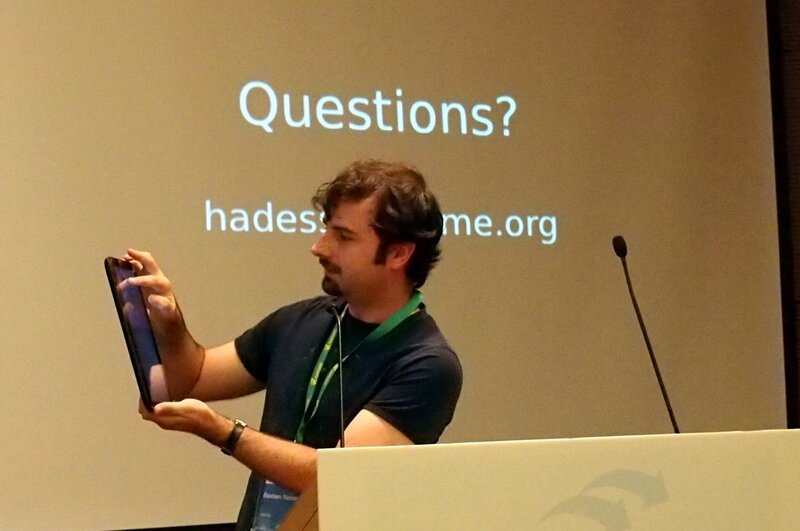 This help our AdBoard members, the Friends of GNOME contributors, the community, as well as the hackfest sponsors, know how the hackfest helped the project. Seeing as we were in a shared event with KDE, I would also like to note that if you want to work on lower levels of the stack, such as hardware enablement, or features that can be shared as standards through FreeDesktop.org, talk to the board about organising a Hackfest. My presentation about tablets (and not sofas) went past. I'll know for next time that antihistamines don't make for a clear mind, but if you were present and I missed a particular subject you were interested in, don't hesitate to contact me. During the conference, Nohemi fixed a number of the bugs I reported through her mentor, and my tablet can now be booted with the on-screen keyboard enabled by default. I also prepared a presentation for the Advisory Board meeting that ties in to the above subjects, which generated a fair bit of discussion, but this will require reporting separately. I was in the winning team at FreeFA, though people say we had too many Brazilian full-backs on our team. See you all next time in A Coruña! Update: No dots in "A Coruña".